Building or cleanup tasks usually generate large amounts of waste from beginning to end. That’s why it’s so important to take steps to manage that waste before you even get started. It doesn’t matter if you are a commercial business, a homeowner tackling a remodel project or you are a contractor getting ready for a new project, you need a way to handle all that rubbish effectively. One of the best ways to take control of excess waste is a roll-off dumpster. They’re large, sturdy and give you a place to put the debris as it’s generated, keeping everything nice and clean. A roll-off dumpster is a big metal bin that rolls off the back of a rolloff-truck into a yard, a driveway or just about anywhere else where waste is accumulating. The truck drops it off at the location and then picks it up in a certain number of days later. These bins come in a range of sizes, and it’s up to you to decide what size you need and how long you will need it for your upcoming project. If you decide that you’ll need a dumpster, you should order one right before you plan on tackling your project. Most dumpsters only come for a set period of time, so you have to be prepared to make use of them as they arrive. Once delivery is made to your home, business or job site, it’s time to get busy. As you move along on your project you simply toss the trash into the dumpster and it’s immediately out of your way. This way your project moves along without worrying about what to do with the junk waste. Once you are finished with the project, the company will come and pick up the dumpster-bin and carry it away, and you have nothing left to worry about. Before you can start working on your project, though, you need to pick the dumpster size that is best-suited to your needs. That’s not always as easy as it seems because it’s tough imagining the size of the dumpster if you’ve never used one before. Here’s a brief chart explaining what each size is good for, so you can make a quick decision, or you can learn and read much more about each option down below, and make a really informed decision. 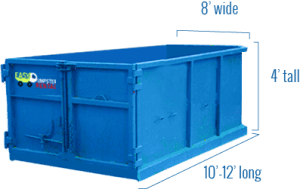 Here’s a general overview of the most common dumpster sizes and what each one is good for. Use this chart if you’re in a hurry to get a dumpster to your home or business and get started with your project. 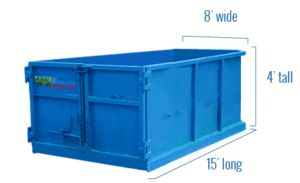 Before taking on any remodeling, construction or cleanup project, one of the most important considerations that you can make is the size of dumpster that you’ll need for the project. Get one that’s too small and you’ll have to wait for the company to remove it and place down another one. This is called dump-and-return. Get one that’s too large and you’re wasting money, or creating a situation where a dumpster is too heavy for safe removal. In situations when the projects are very large or you have very heavy debris such as concrete, you will need to plan on a dump and return from the start. Dumpsters have a maximum weight limit including rolloff trucks. Customers are always asking,” Where is the best place to put a dumpster?” and “What should I be aware of when placing a bin on my property?” Clients typically have 3 options when it comes to dumpster placement. Street – The best place for your dumpster is on the street. This completely eliminates the possibility of doing any damage to your lawn or driveway. The only caveat with the street option is you must first check with your local government officials to see if this permissible and if you need permits. And another consideration, how far from the actual job site do you want to be. Driveway- Is the next preference. Easy Dumpster Rental highly recommends that you go to your local lumber store and purchase either plywood or a couple of planks to place under the wheels of the roll-off. They do get quite heavy and this will lessen the chances of doing damage to your property. Lawn- Lastly, your front or backyard. Again we recommend you get something under the wheels of the container to reduce the damage to your grass and lawn. Also remember if you keep the dumpster for an extended period, the grass may suffer under the plywood and brown-up. The roll-off truck is very heavy in itself, keep this in mind when deciding on the location of placement and if your driveway or lawn will be strong enough to endure the weight of the truck and dumpster plus the debris that you will be disposing of. It is not required, but it is advisable to be home on the day of delivery so that your dumpster is placed exactly where you would like it. You want the delivery to go as smooth as possible and having you or a neighbor there will make sure that is done right the first time. If you live in a gated community make sure you have spoken to the home or condo owners association and that you have secured their permission to have a roll-off on the community’s property. It will be a costly mistake if steps aren’t taken to get the necessary approvals or permits before we show up. And notify the guard at the gate that you are getting a dumpster delivered to your property. If there is no guard please provide gate access code in advance. Think about the size and shape of the objects that you’re removing from your space. If they are small, a smaller dumpster will work just fine. If they are large, like appliances, or long lengths of damaged wood, a larger dumpster will be necessary. Always think about the shape of the objects to make your job as simple as possible. Another consideration that you must make is the actual weight of the things to be removed. While you might have a massive removal project planned, you’ll need to go with the smallest dumpster if you’re removing dirt, concrete, stone or another heavy material. That’s because large dumpsters become too heavy to manage when filled with these materials. 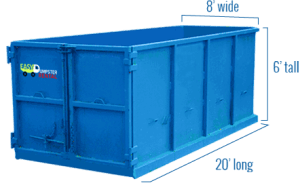 Lightweight and large objects are best-suited for large dumpsters. There is a simple to use rolloff weight calculator, that can estimate your debris’s weight based on measuring its pile and encompassing Pounds/Cubic Yard factor for each specific material you are disposing of. If you really want to be sure of the bin size that you need, consider taking measurements of the debris that you have. For instance, if you’re removing wood flooring, measure the planks to see how big the largest pieces will be. Measure that oversized couch to find out how tall it is. Take a look at that siding and measure it real quick to know how long of a dumpster you’ll need. The more measurements you take, the better idea you’ll have when it comes time to order your roll off container. This is the smallest dumpster that you can get, and it’s good for a range of tasks. 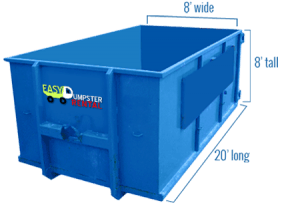 Whether you’re tackling a basic cleanup around several rooms of your home, or you want to clean out an attic or garage space, this dumpster offers just enough space. It’s also one of the only options when removing concrete or dirt. If you’re planning a landscaping project, or you want to replace the flooring in a room or two, this rolloff-can is just the right size for your task. It’s not very tall or long but works well for smaller things like clothing, flooring and even sheetrock or plywood. A 15 cubic yard dumpster is a nice step up in size. While it’s the same depth as the smaller 10 cubic yard dumpsters, it’s five feet longer, giving you space for longer materials such as full-sized 2×4’s or siding slabs that simply wouldn’t fit into the 10-yd dumpster. This is the type of dumpster that you want for serious house cleanup projects, larger landscaping tasks or remodeling projects that extend over several rooms of your home. You’ll be able to get through the walls of two rooms without trouble, you can replace the flooring in three rooms with ease, and you can probably take on an attic and garage cleanout, or even go through your entire house to clean everything out all at once. Just don’t make the mistake of tackling remodeling projects that involve appliances, because this dumpster is not tall enough to accept many of them. The main benefit of moving up in size to a 20-yard dumpster is that you can lay out materials longer than 16’ in length. That’s ideal for siding and very long stretches of wood or other debris. These larger dumpsters are good when replacing an entire roof, especially when dealing with the long and light metal roofing panels. The dumpster is equipped to handle a whole house cleanout with no trouble. If you’re remodeling your home you should be able to fit three or four rooms worth of flooring. You can remodel every part of a single room, including floors, walls and even some of the framing or underlayment with enough space in this dumpster. It’s also the size that people choose when building a new deck, or taking out an old one. When you take a step up from 15 or 20 cubic feet dumpsters, the major benefit that you’re getting is a higher dumpster. The 6’ height is enough to accommodate large appliances and furniture. That’s why so many people opt for this size when taking on remodeling jobs that involve some serious cleanout tasks with oversized furniture items. This is just the right size for other projects like small demolition, removing a swimming pool or large deck, taking on serious construction projects like a home addition, or cleaning out an entire large home that’s 2500 square feet or larger in size. You’ll love how spacious this container is, and most home projects can be completed with this option. This is the ultimate cleanup tool and the largest dumpster that you can get for your projects. These are ideal for large-scale demolition projects when removing lightweight materials like wood, drywall, flooring, siding and metal roofing. They’re very tall at 8’ in height and easily accommodate furniture, appliances and other bulky items. 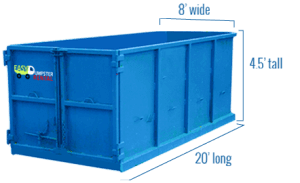 You will want this sized dumpster for cleaning out very messy homes of over 4,000 square feet. They can also be ideal for community cleanup projects. If you’re replacing the roofing on a large home and the roofing isn’t too heavy you can use 40 yarder. You would also want this for new home construction, or when remodeling three or four rooms, entirely. Dumpsters are the ideal tool for tackling tough cleanouts and remodeling or construction projects. They’re built of heavy-gauge steel and stand up nicely to harsh debris like concrete, wood, and metal. You can toss all your debris right into the dumpster, and keep your home or job site clean and organized. A perfectly placed dumpster can also help protect your driveway, or another sensitive area when tackling difficult remodeling tasks like re-roofing a house. You’ll love how organized and clean your home, business or building project looks with a dumpster on site to hold all the trash generated. 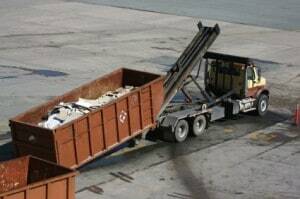 Good waste management is the only way to keep a project on track and clean. Now that you understand exactly what you’re getting with each dumpster option, it’s time to get in touch with your local waste-management company to find out what your options are and what cost is associated with each one. Once you know what type of cost you are looking at for each option, you can quickly make a decision about which is going to be best for you. Take your time and pick the dumpster that’s going to work best for your needs, and do your best to avoid paying for a dumpster that’s way too big, or getting one that isn’t quite large enough for your project.